During the month of April, it was announced the next installment in Level-5’s Yo-Kai Watch video game franchise would be released on the Nintendo Switch. Simply known as Yo-Kai Watch 4, the game was scheduled for Japan later this year. CoroCoro - a monthly Japanese manga magazine - has now revealed the first official video for the upcoming game, in the form of a teaser trailer. The brief clip shows the franchise’s original protagonist, Keita. Also making an appearance is Keita's daughter, Natsume, and Shin - the star of the upcoming Yo-Kai Watch film, Forever Friends. The trailer teases doors will open to three worlds while displaying the key-shaped 'Yo-kai Ark' item. Based on the footage, it appears the title is still on track for a 2018 release in Japan. Meanwhile, in the West, fans of the series continue to wait for the localisation of Yo-Kai Watch 3 on 3DS. 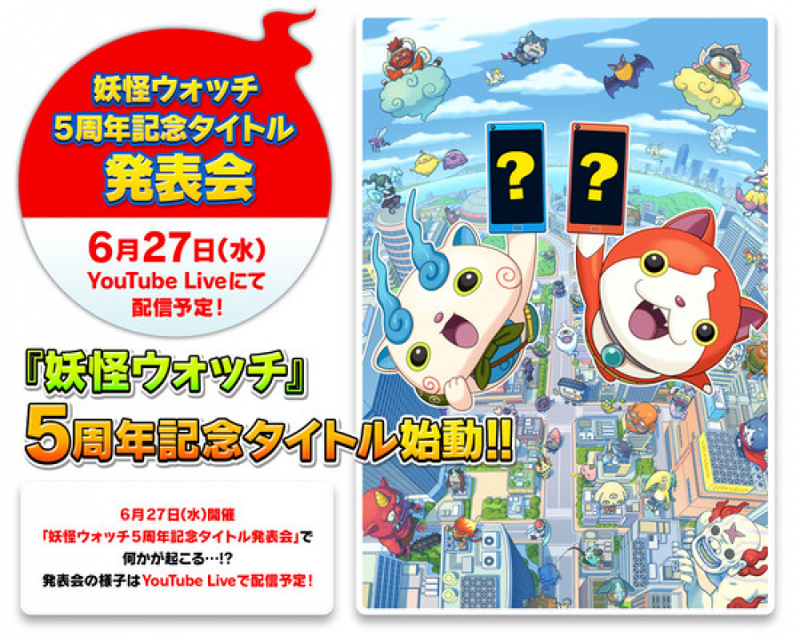 Earlier this month Level-5 opened a website for the 5th-anniversary commemorative Yo-Kai Watch game which will be revealed at a YouTube live stream event on 27th June. The pictures alongside the announcement (as can be seen above) show Yo-kai holding smartphones. Tell us in the comments what you think about the teaser trailer and what you expect from the commemorative announcement. Neat, love the series. Also the Yokai Watch Wibble Wobble mobile game was alot of fun. So I can't wait to see what they got next. Hoping it'll have a Switch version as well. @DragotheKomodo I meant the mobile games lol. I mean we have Fallout Shelter and Pokemon Quest. Might as well get some Yokai Watch mobile action in there. Can't wait for a certain someone's breakdown when he realizes this will have those "scary, not-at-all-kawaii yokai" from Shadow Side. If it ends up coming to the west before Pokemon 2019, I'd say it'll be in the perfect position to expand the fanbase. I'll buy it. I've only played the demo for the first game and the mobile game for a couple of weeks but I'm interested! They need to think the release date very much. With both Pokémon and Smash Bros coming by the end of the year, a release date too close to those games might turn to be a problem for Yokai Watch since it won’t be able to compete with them. They should either release before Pokémon or wait to early next year. Would be perfect at June here. After Fire Emblem, way before Pokémon. Another joke dates as YW1 and 2 will result in the total annihilation of the franchise in the west. Loved the first game despite the weird Battle mechanics, though those truly shine during boss battles. I still need to play my version of Fleshy Souls. At the rate Level-5 games have been getting localized, I predict either 2019 or 2020 for YW4 to come outside of Japan. Has level 5 confirmed any western releases for the switch? For anything?? This is absolutely going to be a system seller in Japan, but it really needs better promotion in the West. If they released the games in a timely fashion, they'd do much better than they are now. Im interested in Yokai Watch 4 and how it will play on the Switch, but the fact that they probably won't release it for another year is what shoots them in the foot. I'll have lost interest by then. Don't forget we have a Bowser's Inside Story remake coming next year. If its not coming this year, I reckon we could see the 3rd game next year as part of 3DS's "continued support". But boy, they really need to shorten the gap between 3 and 4. There's actually plenty of signs. It's confirmed the anime will continue past the YW3 portions, and toy stores have announced the a toy version Yokai Watch U (The watch used in YW3). I don't understand why this game didn't becomes the Pokemon for today's generation. It just feels like that was the original intention. @Wanjia It is... or rather it was, in Japan. Was super popular in 2014-2015 over there, but died out. Many think it was because of oversaturation since they tried to release at least 2 games each year. It never kicked off in the West, save maybe France from what I hear, because it's way to infused in Japanese culture for modern western kids to understand or appreciate and is understandably too childish for the average adult. (That said, I'm an adult and I enjoy the games). I do personally hope it does do a bit better in the west if only enough to make the localization between each game shorter since the cult fans this series does have overseas is pretty devoted. That's the SAME Key design between this video and that video above. Yokai Watch 4 = Yokai Watch Forever Friends ??? Hopefully we'll get Yo-Kai Watch 3 & 4 in the US eventually...after Blasters 3DS.